Body of Lies is a 2008 American spy film based on the novel of the same name by David Ignatius about a CIA operative who goes to Jordan to track a high-ranking terrorist. The film is directed by Ridley Scott, written by William Monahan, and stars Leonardo DiCaprio, Russell Crowe, Vince Colosimo, and Iranian actress Golshifteh Farahani. Production took place in Washington D.C. and Morocco. 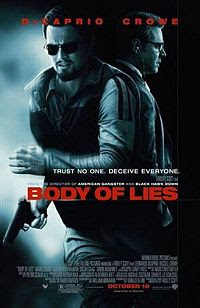 Body of Lies was released in the United States on October 10, 2008.